Videocassette: 1990, 2 commercials on 1 videocassette. 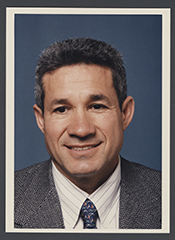 The commercials were used during Frank Tejedas campaign for a 1990 state senatorial election in Texas, Democratic Party. Oral History: In the Oral history interview with Frank Madla, 2003, 1 videocassette. He talks at length about his friendship with Frank Tejeda.